A re-engineering of a favorite wintertime soup, Pho bo, or Vietnamese beef noodle soup. Real pho is made from an hours-long simmer of beef bones to make a light beef stock, but this recipe can be made on a weeknight in under an hour. Feeds four, and requires about 45 minutes to prepare. 1 tablespoon of “Three Crab” brand nam pla (fish sauce; in Vietnamese, nuoc mam). Use only excellent quality Thai or Vietnamese fish sauce sold in glass bottles. The cheap supermarket stuff reeks of old fish. Good nam pla has a strong savory smell that is only faintly fishy. Three Crab Fish Sauce is available on Amazon. Roast the onions and ginger until just brown in a toaster oven, or in a sauté pan, then combine all the stock ingredients and bring up to a a boil, then down to a low simmer. Use rice noodles for a more authentic pho. I find the rice noodles too bland, and usually prepare some capellini (angel hair) pasta as an alternative. Cook either or both as directed to be done about 5 minutes before serving the soup. Drain and place in a bowl so guests can assemble their soups themselves. Use a very tender cut of beef like filet mignon. Freeze several filets, then let them thaw partially in the refrigerator so that it is easier to slice into very fine slices. Slice the meat as finely as you can, and set aside. The beef slices are cooked in the final moments before serving by placing them in the bowls of hot soup and noodles. If you add the beef too soon even filet will toughen more than is ideal. The fine slices will cook instantly in the hot broth and stay tender. Pho bo is normally garnished with fresh vegetable and herb ingredients that, like the beef, are added to the hot broth at the last minute and cook lightly in the soup. .5 cup finely sliced fresh basil. Thai basil is ideal, but Italian basil will do. Pictured here: Broccolini that I lightly blanched in the microwave. 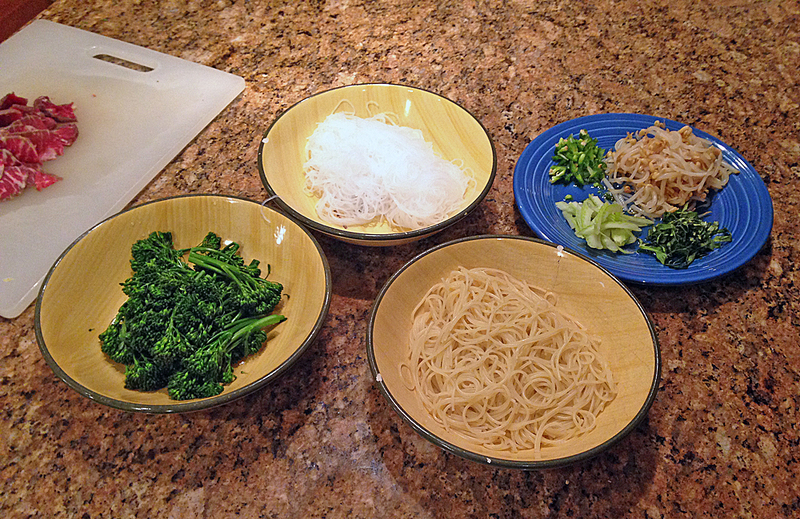 Don’t fully cook the broccolini (or other vegetables), as the hot pho broth will finish the cooking. Many other vegetable ingredients work well with pho, such as finely diced zucchini, thinly-sliced mushrooms, sweet red or green pepper slivers, or shredded carrot. Finely slice the raw vegetables to cook lightly in the broth just as the soup is served. Bring the broth up to a full rolling boil and then turn off the heat. Quickly place a serving of noodles in each serving bowl, and ladle the hot broth over the noodles. 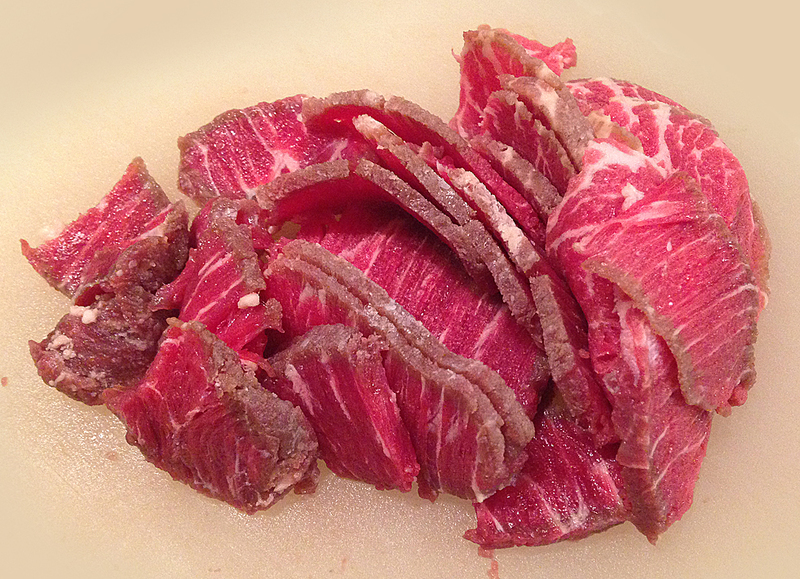 Add the raw beef slices and other ingredients and stir lightly. Eat immediately to keep the beef tender.